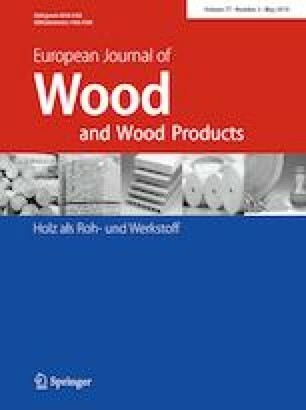 In this study, a fabrication method for laminated veneer lumber (LVL) was developed. The novel LVL (NLVL) was produced with poplar fibrosis veneers and phenolic formaldehyde. Some tests were conducted to evaluate the properties of the NLVL with different densities (ranging from 0.8 to 1.2 g cm−3), such as mechanical properties, water resistance and surface behavior. As a result of the data obtained from the tests, the mechanical properties and water resistance of the NLVL were observed to be superior to those values of the traditional LVL (TLVL) and could be used as engineering materials. In addition, the density played an important role in improving the properties of the NLVL. It can be concluded that the mechanical properties, surface wettability and roughness improved. Conversely, with regard to the surface energy, the calculations carried out by two models unanimously indicated that the total surface free energy declined dramatically on account of the densification process. Finally, the apertures of vessels and the fiber cells decreased with the density increasing. As a consequence, the penetration routes of moisture into the NLVL reduced significantly and in turn enhanced the water resistance. Yanan Wei performed the experiments, analyzed the data, and wrote the manuscript; Fei Rao helped Yanan Wei in performing the verification experiments after we received the reviews’ comments. Ruiqing Gao contributed to providing experimental equipment and explaining how to use the equipment; Yanglun Yu reviewed the manuscript; Wenji Yu conceived and designed the experiments; Yuxiang Huang directed test operation during experiment process. The authors appreciate the financial support from the National Key R&D Program of China (2017YFD0601205) and Major Science and Technology Program of Hunan Province (2017NK1010).